"For the third year in a row, the country is off-track to reaching a 90 percent high school graduation rate and the gains are not fast enough with four years to go to reach the nation’s goal. If we agree that it is fundamental that every child have an equal opportunity, then we must continue to be alarmed by the persistent and remaining gaps among various subgroups of students. While we are glad to see the rate of increase among the key subgroups, the progress is not sufficient. "Let’s be clear: High school graduation is an indicator toward adult success, not a destination. But the hard truth is that a life without one consigns a young person to almost certain failure. "In today’s world, young people who don’t graduate from high school have virtually no chance to find a job with a family supporting wage. The nation simply can’t afford this waste of talent. We need a sense of urgency at every level – from the kitchen table to the schoolhouse to the highest reaches of corporations and government. It is simply unacceptable to leave so many young people behind. "It is particularly unacceptable because we know that progress is possible. The steady rise of the graduation rate over the past decade proves that progress is possible thanks in large part to the hard work of families, schools, communities, and organizations coming together to improve youth outcomes. This progress means that there are now 2.8 million more students who have a chance to move ahead in life. But our work is not done. "Young people face a myriad of challenges today – changing economics, a shifting job market, discrimination and fear. And while children are often resilient in the face of adversity, they cannot and should not do it alone. “The barriers young people face will not be lifted overnight. The question is whether we collectively have the fortitude and desire to get it done. To finish the job, to reach the 90 percent goal, we must accelerate progress with the five subgroups of young people who make up a disproportionate amount of the remaining non-graduates: low-income students (now account for more than half of the students in public schools), students of color, students with disabilities, English learners (now the fastest-growing student population in the country), and homeless students (more than 1.3 million public school students affected). This is how we reach a more equitable future. “Put another way, that’s an additional 250,000 young people who would need to graduate on time by 2020. We can do that. That is an attainable outcome. But it won’t be easy. “Real change for young people happens locally – in schools and communities around the country, but accountability is a must. When the federal government monitors ESSA implementation, it must ensure that state accountability systems result in effective supports and resources for low-performing schools and traditionally underserved students – in particular, America’s high schools. We cannot become a nation that fails to invest in youth. “Furthermore, online schools, credit recovery programs and multiple diplomas that are not consistently expected to achieve positive student outcomes also challenge the progress that has been made over the past 10 years and put certain young people at a disadvantage. And any fudging of graduation rate data hurts students and compromises their chances for success. These are issues that we must continue to address and put pressure on if we are to stand by the goal that we seek. “Based on the experiences and observations over the last decade by those working directly in schools and communities, and by holding more than 200 community-based summits on the high school dropout challenge in all 50 states, we developed a GradNation Action Platform to reflect lessons learned in increasing graduation rates and to help focus action locally to close the gap to a 90 percent on time graduation. Any community that knows the needs of its youth and can act in two or more of these action areas is likely to see improvements in outcomes. GRADNATION ACTION PLATFORM: This framework for action is based on the collective experience and expertise of practitioners in the field as well as young people. The Action Platform highlights six areas of focus for policy and practice to raise high school graduation rates locally. More information can be found here. NEW BUILDING A GRAD NATION REPORT: The new Building a Grad Nation report will be released in the spring. An analysis of last year’s data can be found here. 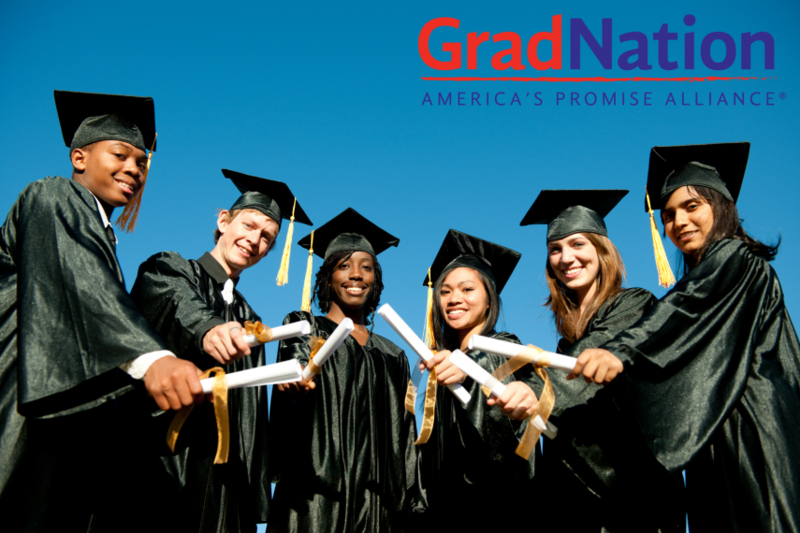 MEDIA CONTACT: If you have questions or would like to speak with a representative from the GradNation campaign, please contact Daria Hall at dariah@americaspromise.org or Tonya Williams at tonyaw@americaspromise.org.